Currently viewing the tag: "mPower"
Or, based on the picture, maybe this post should be titled Flashlights In Space! 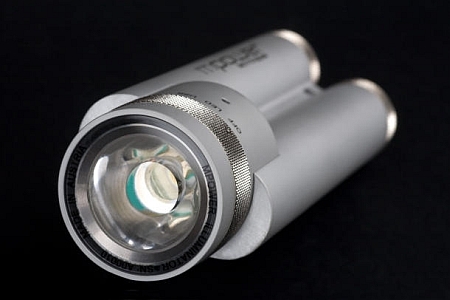 Now I like flashlights as much as — or probably way more than — the average Toolmonger, but the mPower Emergency Illuminator that I recently saw on Gizmodo is a bit much even for me. Porsche Studios designed it, and mPower, a wholly-owned consumer products division of mPhase Technologies, uses its parent company’s AlwaysReady Smart NanoBattery technology to produce a two-tubed flashlight with two standard CR123 batteries in one tube, and an unactivated NanoBattery in the other. The NanoBattery side has a minimum 20-year shelf life with no power dissipation until activation. It’s to debut at CES in January, and should be available in March 2010 for a mere $250–$300. For that price you do get a “high power” LED and an accessory USB connection for charging cell phones and PDAs. Think there might be something better in the next 20 years?